REVIEW OF POETRY BOOK INSPIRE BY VIJAYA GOWRISANKAR. Today I want to share with you a book of poems titled “Inspire” by Vijaya Gowrisankar. I feel very honored to have had the opportunity to read the wonderful collection Vijaya has written, a collection of over one hundred poems. Today I want to share with you a book of poems titled “Inspire” by Vijaya Gowrisankar. I feel very honored to have had the opportunity to read the wonderful collection Vijaya has written, a collection of over one hundred poems. Each poem is full of life and the circles of life that one person changes through that can so easily be fit to any one of our lives, and somehow Vijaya writes in a way to comfort us in these similarities. There is a simplicity in the complexity of life in the poems that brings about a spiritual feeling from the speakers overall experience and transport from the page to the reader. In a way it’s like the speaker is a small bird up in a tree following a woman around in her process of growth from child, to daughter, to career person, to wife, to mother, to thinker, philosopher, and to parent and then losing a parent and beginning to have to stand strong everyday on her own, although you realize she has been standing strong all along. Although there is a flow and connected nature to each poem, each one gently speaks about something different, in the subtle ways that life changes over time like the process of a tree from seed to leaves falling and regrowing. I especially like the poem “Grace” as it draws a parallel to the speakers’ own life that seemed to be full of joy but with usual ups and downs that are normal in life but Graces life was more full of hardship and yet she stayed strong in the face of it all. Two glimpses of women that have lived two very different lives and both are strong and wonderful as a result. This begs the question to me our perception of what struggle really is. When we perceive struggle in one person and our perception of another as someone having it all and doesn’t seem like they have struggle yet they do? It is important to me to be aware of these things. 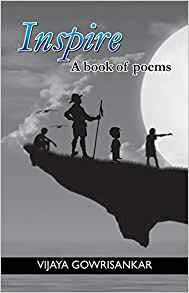 With over a hundred poems, very inspirational, comfortable to read you are sure to find several poems that you love, I know I did! “Inspire” a book of poems by Vijaya Gowrisankar. The poems are written in English published by Cyberwit. Happy Reading! Poetry Unplugged by Irene Brodsky includes poems revealing lyrical moments of sweetness. The most appealing quality of Irene’s poems is their supreme gift of simplicity, devoid of any trace of laboured vocabulary. No doubt, the inspiration of Irene in this collection has created very fine poems full of delicate and fine felicity of expression. There is a grand sagacity rising from Lynn Strongin's The Quickening; the wisdom of the ancient faith of the Hebraic People, Christians, and, her small flirting with existentialism. Speaking a language other than his mother tongue Sinhala he sees his journey and arrival into a land that cannot seem to fulfill his dreams. It follows that his poems are those of himself and the other refugees who surround him. His A refugee’s Night is on “a snowy bench and no more,” a rendition of the penniless traveler or the homeless. It is the pain of loss. Having composed 3,000 poems, Arlene Corwin has extended the thematically based book Birth, Death & In Between II, the theme repeating it seems, lifelong – repeated, but never repetitive.